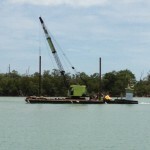 Garland & Garland, Inc. has been a proud name in marine construction in Collier County, Florida since 1965. Now, years later, Al & Alex Garland continue to maintain the highest integrity, exceptional service and outstanding quality. 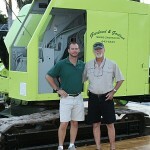 Garland & Garland owns and operates a fleet of floating and land based construction equipment. We are state licensed and fully insured with United States Longshoremen and Harbor Insurance. We are members of Collier Building Industry Assoc., Florida Marine Contractors Assoc., National Federation of Independent Businesses and Rotary International. Real Estate & Construction Review magazine acknowledged Garland & Garland for their contributions to Ave Maria University in making it one of the “Top Projects in Florida”. Al Garland has been a member of Naples North Rotary since 1970 and has been given several “Paul Harris Fellows” for his continued service. Alex Garland was awarded “Rotarian of the Year” in 2011, for his outstanding, “unselfish commitment to the club” and his “untiring leadership throughout the year”.